My husband and I laugh at the word "saving" these days. With four little ones and a tight budget, it seems like most of the money is spoken for before it even hits the direct deposit. Right now I am saving for a Berkey water filter. These things are amazing! They filter all of the chlorine and fluoride out of your tap water and leave behind trace minerals for your body. It is also great to have trace minerals for making water kefir, which is my hubby's new favorite drink (and finally the thing to get him off the cokes). Our health journey has always one step at a time. I always remember my first introduction to Nourishing Traditions and the WAPF. I was so overwhelmed, and we were eating (relatively) healthy already. As you continue to gather information about big agriculture and the shady food industry, there always seems like there is one more step to take. I have been wanting to get off of tap water for quite some time, I just haven't been able to comprehend the price of a water service fitting into my budget. When I first heard of Berkey, I was intrigued by a permanent fixture in my kitchen. The filters are cleanable. So, although it is a large upfront purchase, it is a long time investment. I remember when I saved for my stand mixer, and how amazing it felt to make bread in it for the first time. It was such a gratifying feeling. I'm looking forward to a tall glass of gratification. A lot of blogs are giving them away and I've been trying my hardest to win one! 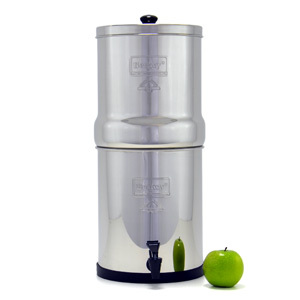 Here's a current contest: http://kellythekitchenkop.com/2012/05/big-berkey-water-filter-giveaway-from-lpc-survival-worth-258.html. Kelly the Kitchen Kop is giving away a Big Berkey! I'm crossing my fingers it's too me!! What is your next big kitchen purchase?